What makes a good Bike Shed? Need to get your Bikes or Motorbike out of the garage or weather and into a practical and secure lock up? Bikes are long skinny items that can often be difficult to store as storage sheds predominately have the door situated on the long wall. We have the largest range of sheds with both our Wooden and Steel sheds able to be custom made to create the perfect bike storage for you! Read the tips below to help you invest in the right bike shed. The first important step would be to decide what sized shed you require or have room for. Do you only want to store your bikes or Motorbike? Or do you need a large shed to store the mower and gardening tools as well as the bikes? 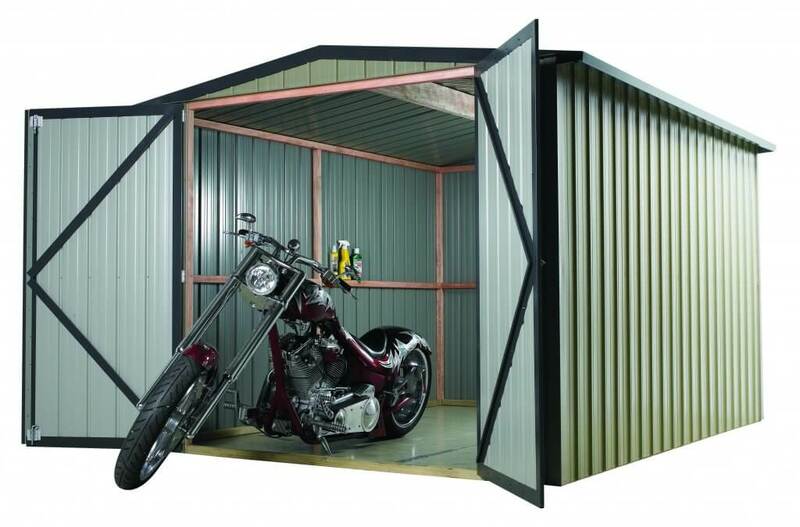 As bikes / Motorbikes are long skinny items you generally require a long skinny shed with the door on the short wall. Both the Pinehaven and Cedar wooden sheds and the Garden Master and Duratuf Steel sheds can be customised to accommodate bikes. It is as simple as ordering a door change and moving the door to the short wall. How wide are your handle bars? Will a single door be wide enough? Do you need an extra wide single door or double doors on the end? All the brands mentioned in this post can be custom made so any of these options can be done! Do you need a shed with internal timber framing? Internal timber framing is a huge benefit to your storage shed, as well as creating a strong backbone for your shed it also allows shelving and tool boards to be easily attached and makes great use of the wall space which is often wasted in steel sheds. Hang your bike gear off the walls and create a super organised bike shed with plenty of space for storing other items. Along with the Pinehaven and Cedar timber sheds the Duratuf steel sheds also feature full internal timber framing. The timber framing is often advantageous in smaller sheds as there isn’t a lot of floor space. Do you need a clear roof panel, solar light or extra door for added light? Moving the door to the end wall and creating a long skinny shed means the opposite end of the shed can be very dark. In sheds 3m long and above we would suggest a clear roof panel, solar light or extra door. An extra door, to create two openings, may be beneficial as you wont have to squeeze past your bikes / Motorbike every time you need to access your items at the other end of the shed. Do you need a ramp? If using your Bike Shed to store a motorbike you may want to consider a ramp. If you are wanting our assemblers to install your shed on site they can purchase extra timber and build a ramp at an additional cost. Please contact us for pricing as this depends on the shed ordered and the foundation the shed is sitting on. 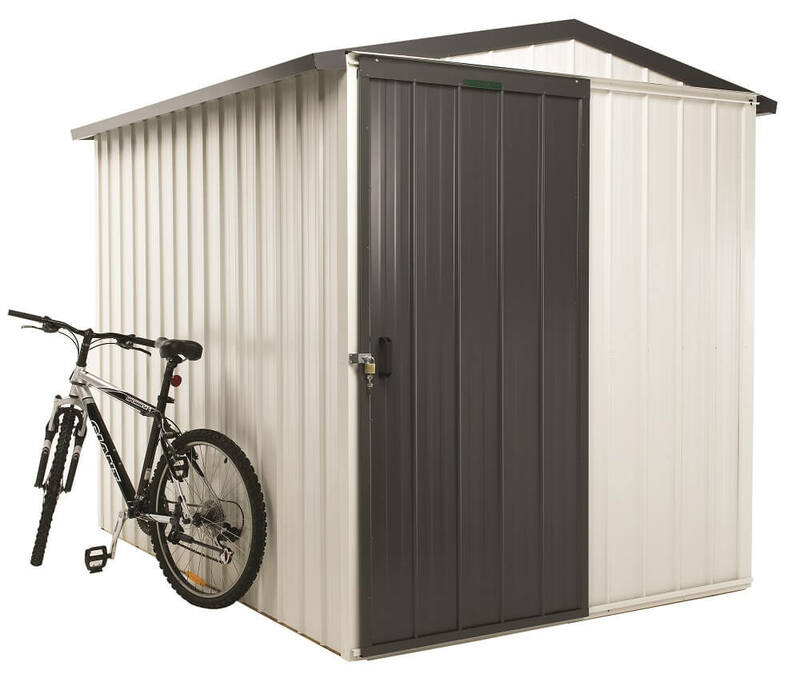 To check out the Pinehaven and Cedar wooden Bike sheds click here or to check out the Garden Master and Duratuf Steel bike sheds click here. Please contact us with any special requirements or questions and we will design a shed to suit your needs.